Prior to founding Tour and Explore Jerusalem, Nicole Goldstein Strassman (Nikky Strassman) spent ten years as the Deputy Director of Public Affairs at the Supreme Court of Israel. In this capacity she organized and guided tours, presenting explanations of the Israeli legal system to audiences from Israel and overseas including soldiers on educational training seminars, students, Israeli government officials and representatives of major Jewish organizations. As the staff member responsible for the development, implementation and running of the court’s educational programs, Nikky set up programs debating philosophical issues of human dignity, violence prevention and other law-related topics. One of Nikky’s initiatives was to set up a program in conjunction with the Israeli Ministry of Education for disadvantaged children to learn about the legal system. Classes were taught by legal interns, lawyers and Supreme Court Justices who volunteered their time and expertise. 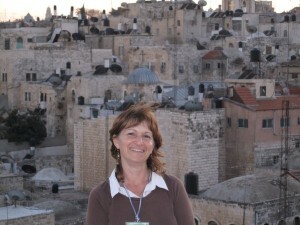 Nikky Strassman is a licensed tour guide specializing in Jerusalem studies, interactive Jerusalem tours for children, and informal law-related topics . Nicole was born in London, England, received a BA from Hebrew University and an MSW from University of Michigan.